A little frog went out one day to play. While leaving the pond, he saw a large ox grazing in a field. He had never seen any creature so large in his life. The size of this animal frightened him, and he hopped right back to his father, the bullfrog. "Father, father, I have just seen the biggest frog in the world!" he said. "Humph!" said the bullfrog. "Was he as big as me?" and he puffed himself up. "Oh, he was much bigger than that!" said the little frog. 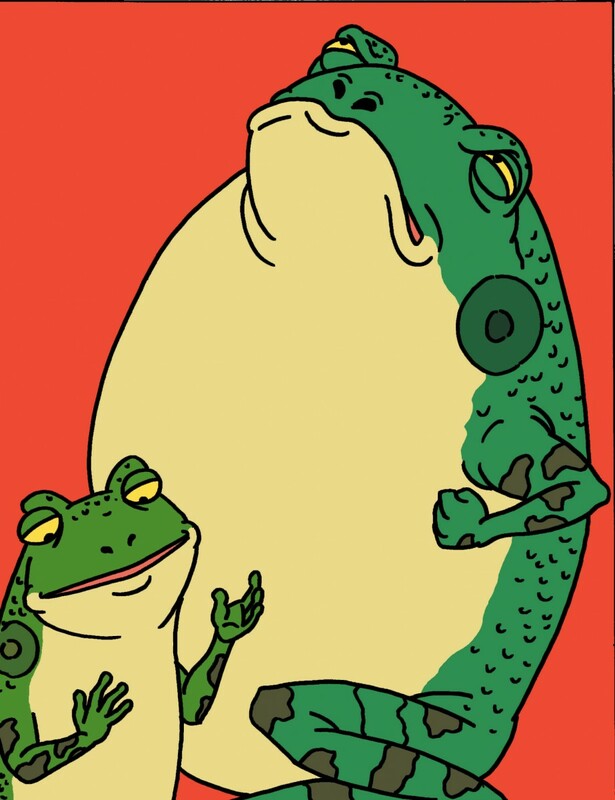 "Was he THIS big," said the bullfrog, puffing himself up even larger. "Much, much bigger than you!" said the little frog. "Ridiculous!" said the bullfrog. The old bullfrog believed that he was the largest animal in the world. No one could be bigger than he was! "He couldn't be bigger than me! I'm the oldest frog in the pond. I was here first! Was he bigger than THIS?" "Much, much bigger," said the little frog. "Bigger than THIS???" The bullfrog inhaled again.He puffed and himself up so much until BANG! He burst wide open! "Don't pretend to be bigger than you are!"